Chicken Parmigiana Without the Guilt! Chicken Parmigiana straight from the oven. 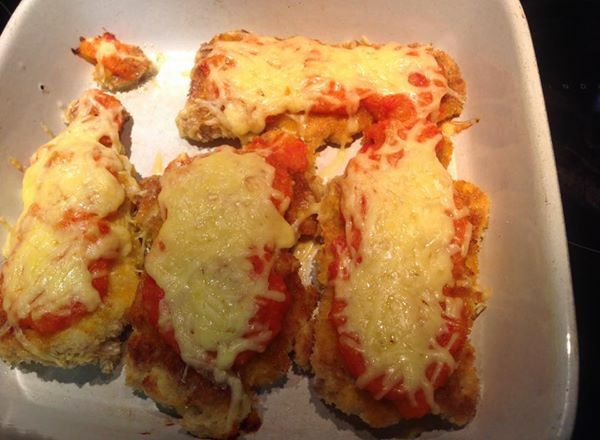 Chicken Parmigiana with a chilli, capsicum and tomato sauce! Ok, before you say this sort of food shouldn’t be posted on this page, I want to let you know that I made it all from scratch except the bread crumbs ( a bit of disorganisation on my behalf). 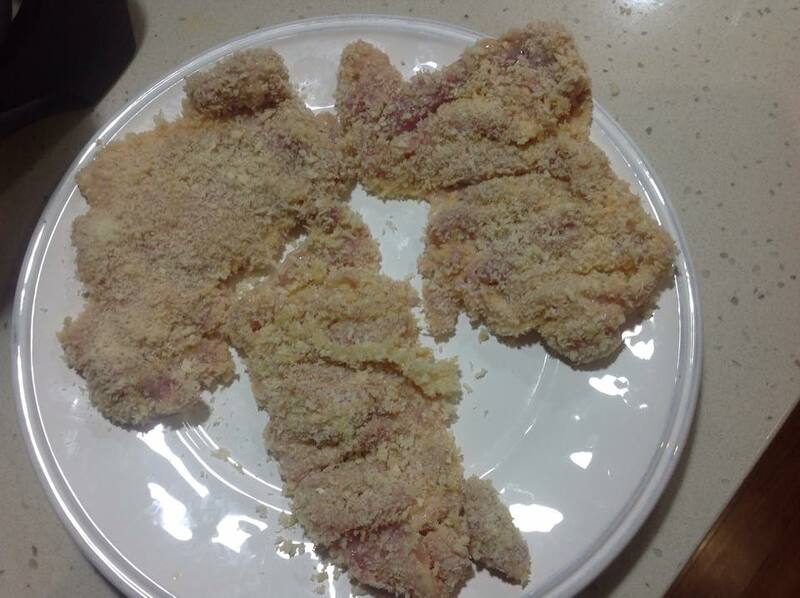 To coat the chicken thighs I coated them in wholemeal flour then dipped them in scrambled eggs and finally covered them with panko bread crumbs. I fried them gently until cooked on a gentle heat with olive oil. PS: the thigh fillets tend to be a little un uniform in shape so I make a series of cuts in the meat being careful not to cut all the way through. Place 2 finely chopped onions and 2 crushed garlic cloves in a sauce pan and Sautée gently until soft. Whilst the onion is cooking place the following ingredients into a blender: 1 red capsicum and 4 very ripe red tomatoes, whizz until smooth. Now add the tomato, capsicum mixture into the onions and garlic, add some ground dried chilli to your liking and cook until nicely reduced and thick. To assemble: place the cooked chicken into a baking dish, top with a few spoonfuls of sauce then sprinkle with some cheese. Place under the grill and cook until the cheese is nicely melted. Serve with some greens. 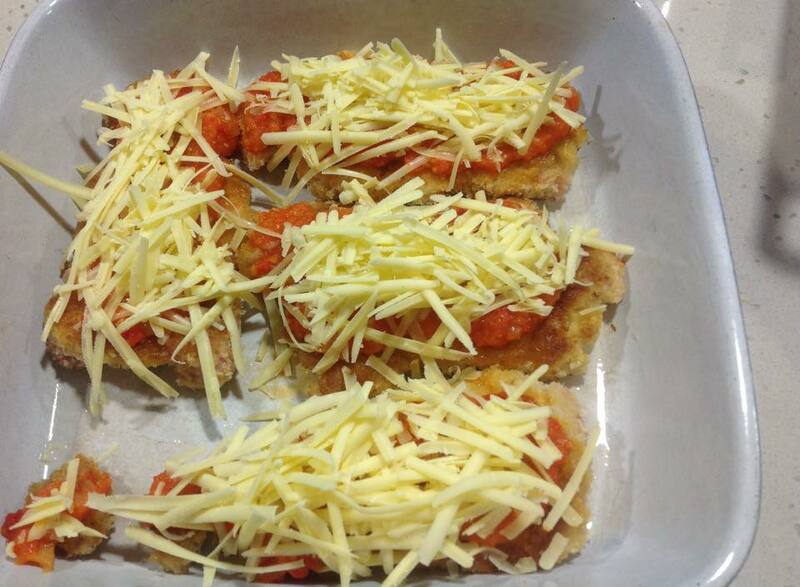 Chicken Parmigiana ready to pop into the oven.